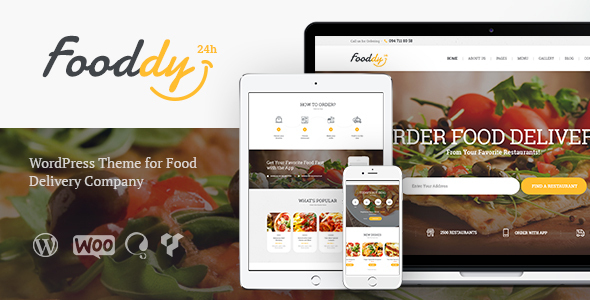 Fooddy 24/7 is a stylish and powerfull WordPress theme with a design created for online food ordering and food delivery website or application. You can also use the them as just a food / lyfestyle blog, online cookbook or recipe website. Or you may want to turn it into a restaurantâ€™s / cafeâ€™s website. Thereâ€™s so many options to use this colorful WordPress theme! The theme has an intuitive visual interface and informative layout that looks wonderful on any platform, since itâ€™s fully responsive and Retina ready. The theme allows to create tons of your own page layouts due to Visual Composer compatibility. We made the theme WooCommerce ready and supplied it with a respective shop design. The theme is compatible with a bundle of premium plugins: Revolution Slider, Essential Grid and Visual Composer to make it easy for you to setup your website and run your food delivery business.